This tab controls settings for note text ($Text). Paragraph Spacing. Pop-up menu controls $ParagraphSpacing. Default is 8pt (set via preferences). Line Spacing. Pop-up menu controls $LineSpacing. Default is 100%. Set larger percentage values to increase line spacing and vice versa. Don't check spelling. Toggles $NoSpelling for selected notes. Smart Quotes. 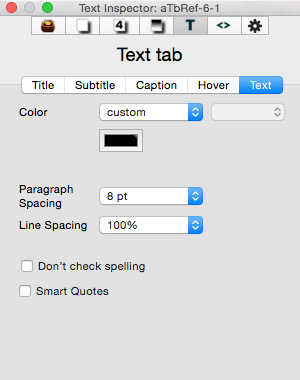 Overrides default substitution settings for straight-to-curly quote correction ($SmartQuotes).